The sources for this series come from the website of the same name owned and run very close to me. • False declaration of intention and misleading description when recruiting members. • Manipulation by psychological methods (mind control) is used during recruitment and indoctrination. • An all-powerful leader who demands total subjection and claims to have special knowledge and powers. • The ideology must not be questioned, doubt is something evil, which must be fought. • The image of reality is black and white: the members are the chosen (good), everything outside of the movement is evil and must be opposed. • There is a lot of money involved, which sometimes emanates from crime. International freemasonry complies with all these criteria of a destructive sect, but FRI refuses to criticise freemasonry and instead slanders those who expose political freemasonry. On 15 April 2000, the association in Stockholm invited Hakan Blomqvist from Norr- koping to give a public lecture. Blomqvist, who is a professional liar, "humanist" and "Nazi-hunter", refused several times during his lecture to answer the question whether freemasonry was a destructive sect or not. The reader might be able to guess whose interests this man serves. The most dangerous sect of them all - freemasonry - has not detached itself from society, but intervenes in its development in a very negative way. Presumably the freemasons have succeeded in their indoctrination of society, since they are no longer regarded as a serious threat. The masons are in control of the mass media. "If one controls radio, press, school, church, art, science, film - one can transform each truth into a lie, each unreason into reason." (Alf Ahlberg, "Idealen and deras skuggbilder" / 'The Ideals and Their Shadows", Stockholm, 1936, p. 135) The masses have always believed in those gods that propagate themselves most dramatically. "The power to control the news flow is the same thing as the power to control how people think. We boast about free press in the United States. But how free is it really when we receive the same news from all the big media conglomerates and when alternative opinions never reach the majority of Americans? The power to report and describe reality is now in the hands of a few. And the interest of these few powerful people is in opposition to the interest of the people, the general interest. It makes no difference that these media conglomerates have different names and appearances, since they all share the same values, which is a guarantee that we receive cloned information." (The American newspaper The Nation, reported by Aftonbladet, 31 October 1997) The few who control the flow of information belong to inter- national freemasonry. These forces do not care about the interests of the people. Noam Chomsky wrote: "Propaganda works more effectively if one manages to maintain the illusion that the mass media are non-partial observers. Tough debates within invisible boundaries will actually have the effect of strengthening the system." It is not possible to control masonic lodges or other elite struc- tures. We know that a group, which cannot be controlled, im- mediately begins to manipulate the press and believes that it stands above the law. The freemasons use myths as the base of their power in their war against mankind. (I want to be honest here, Juri Lina's next paragraphs have not been included. 2. so they can nick any artefacts which they regard as being invested with great power. Which is the second point Juri Lina is ignorant of. He says there are no witches. They only rule the planet Juri...but you don't recognise them. As you come into thirdlevel Christianity you learn there is essentially little difference between the top Vatican, Jesuit, Buddhist,Freemasonic, Hermetic order Golden Dawn world. Many dislike using the term Satan, and prefer,Solar Cult, Apollo, Lucifer...bringer of Light. Rothschild just built a Temple to Apollo in his Oxfordshire "back garden". The socalled GREAT WORK is nothing less than the Antichrist system, which comes as a huge shock to New Agers. conventional biology becomes intrinsically insuperable. The unique qualities of man (conscience, morals and religion) do not correspond at all to the evolutionary thesis of "the survival of the fittest". A martyr chooses death rather than forsaking his beliefs. Hoyle stressed that science must once again accept that there is a greater intelligence in the universe. Sir Fred Hoyle believes that Darwin's evolutionary theory is a damaging myth. He stated: "We must adjust ourselves to this in our scientific research programs." The theory of evolution was worked out by the Lunar Society, founded on the initiative of the high-ranking freemason Benjamin Franklin in Birmingham, England in 1765. He later emigrated to America. The members gathered once a month at the full moon. The society was a revolutionary masonic organization that supported the overthrow of monarchies and undermining the belief in God (Ian T. Taylor, "In the Minds of Men: Darwin and the New World Order", Minneapolis, 1984, p. 55). An important member of the Lunar Society was Erasmus Darwin (1731-1802). He became the grandfather of Charles Robert Darwin and between 1794-96 wrote the book "Zoo-nomia, or the Laws of Organic Life", the conclusion of which was the same as that of "On the Origin of Species", which his grandson wrote in 1859. In this way, the freemasons managed to spread misinformation about how we only live one life on Earth and that we are alone in the universe, which created itself out of nothing. According to huma- nists, all human development ends with physical death. Darwin's "The Origin of the Species" is a fraud. The word "evolution" first appeared in the sixth edition, printed in 1872, the same year the author died. In his book "In the Minds of Men: Darwin and the New World Order", the scientist Ian T. Taylor revealed how the Lunar Society and other masonic organizations have led many intellectuals astray with their manipulations and with the aid of "modern" science. Both Erasmus Darwin and his friend James Watt in the Lunar Society were freemasons. The older Darwin was initiated into St David's Lodge No. 36 in Edinburgh in 1754. He later also became a member of Canongate Kilwinning Lodge No. 2 (Freemasonry Today, autumn 1999). Scientists now admit that the Neanderthals were not our forebears, since the DNA analysis of the mitochondria shows that they belonged to another species altogether. Svante Paabo, professor of biology at Munich University, proved that they were not our ancestors (Natur & Vetenskap, No. 9, 1997, p. 11). Charles Darwin later developed an ideology, called humanism, which international freemasonry began to utilise as a weapon against people with spiritual beliefs. Charles Darwin was just an errand boy for the masonic elite. With the help of "humanistic" organizations, the freemasons have spread atheism and other false doctrines. The British quantum physicist Paul Davies, however, postulates in his interesting book "God and the New Physics" (1983) that "a ruling universal consciousness utilises the laws of nature for a determined purpose". In his opinion, quantum physics is the surest way to find God today. Paul Davies writes in an article: "The very fact that the universe is in the process of creation and that its laws have allowed complex structures to come into existence and develop into conscious life, is for me a strong testimony that something is happening behind the scenes. I find it impossible to deny the impression that everything is planned..." (Svenska Dagbladet, 3 March 1989, p. 14) Sigmund Freud's theory of psychoanalysis was just a huge bluff. This was revealed by, among others, Daniel Stern, an American pro- fessor of psychiatry in Geneva. Freud's so-called regressive model is not true, Stern claims. If it were true, it would be possible to use it to predict people's problems or to show a connection between early disturbances and problems later in life. But this has not been successful (Svenska Dagbladet, 1 June 1990). Freud belonged to the Jewish masonic organization B'nai B'rith (Peter Gay, "Freud", Stockholm, 1990, p. 158). During the period when Freud was working on his theory of psychoanalysis (1880- 1890), he used cocaine daily. Cocaine is a powerful sexual stimulant. He praised the drug and handed it out to friends and acquaintances. He even wrote "songs of praise" in its honour. Freud introduced cocaine to the Western world. The Museum has undergone some dramatic changes over the years. There is now a huge area devoted to dinosaurs and another to Human Biology. Most of the displays are purely descriptive, but a good number are all presented in a way that shows just how close we are to animals. It would be tedious to look at all the many thousands of exhibits and point out their errors of fact or the way in which evolution is promoted, sometimes openly, but often more subtly. It does not require much knowledge of the evidence against evolution to go round the museum's exhibits and note how the theory is being promoted in so very many ways. The reader might like to do this for his own edification and enlightenment to see in what way and to what degree each exhibit promotes evolution. I will just give few examples, and then look a little more closely at the link the museum has always tried to forge with great effort - the vital link between man and apes. 1. Darwin's statue. For many years statues of Darwin and Huxley were at the end of the main hall, but were then moved to a small area behind. Darwin has now been restored to his former position at the end of the main hall, seated in white splendour overseeing the whole of the hall area below him. What has happened to Huxley's statue I do not know. 2. The Darwin Canopy (left of the Main Hall). At the time of my visit, it was intended that the ceiling would be painted by different artists using themes about Darwin's life. (i) Finches. The claim that Darwin noticed the different beaks of the finches on the Galapagos islands had now been corrected. It was an ornithologist who pointed this out to him after his return to England. (ii) Peppered Moth. Another panel was to be about the increase of the dark form of the moth as industrial smoke made the trees darker thus exposing the lighter form to predation. Judith Hooper in her book Of Moths and Men denounced Kettlewell's experiments with these moths which she called "shoddy". The Italian Professor Sermonti published his criticisms of the experiments in 1984 and, following correspondence with him, I also criticised them in 1991 [See Ref.74 second edition p166-178 (First edition p195-211)]. (iii) Human and dog embryos. Darwin did not discover this "similarity". Ernst Haeckel in Germany proposed that embryos went through the phases of evolution of their ancestors - the (so-called) "gill slits" were due to the "fish" ancestry of humans etc. It is now well known that he deliberately faked his drawings to make several em­bryos look alike. 4. Primates. In the Primates section (1st. floor left gallery) they show how animals engage in bonding, useful play, hierarchies, infant care etc., and humans are shown to have the same characteristics - with the implication that we are not all that much different to them. This continual emphasis on our close relationship with monkeys is predomi­nant here and in the section on "Our Living Relatives" which we examine a little more fully now. The previous title to this display was "Man's place in evolution", both titles looking upon man as only a normal part of the animal kingdom. The first panel is entitled "We belong to the ape family". No distinction here for human beings. A. Cladograms or "Relationship Charts". It is noticeable that these charts that give the relationships between species are very promi­nent. That man has special and very distinct abilities well beyond those of animals is never mentioned. B. Homo erectus and fire. A panel says "There is evidence that Homo erectus people living near Beijing [Pekin] in China were able to use fire" and there is a section of ashes about 25cm (10 inches) thick below the panel. In actual fact, a visiting professor to this site revealed that it was a huge pile of ash 7m (24f) high and had been kept burning fora long time! This was a capability well beyond that of apes, and it was probably a lime burning furnace for thebuilding of Pekin. This panel also mentions "Ash layers, charcoal and burnt bones have been found with Homo erectus remains in a cave site at Zhoudoukian [The excavation site]". This is an interesting twist on what was actually found on this site. In parts of the furnace, they found ape skulls, always broken into pieces. These were immediately publicised as the "ape­men" responsible for the fire. Later still, they found five complete skeletons of human beings in a cave connected to the main furnace area. Usually, it is the monkey skulls only that are mentioned, but here we have the admission that some H. erectus were found in a cave site. That human skeletons were found nearby was unwelcome and they were only reported on in an obscure journal five years later. What actually happened is that early human hunters caught monkeys in the forests, but as their meat is too tough to eat, they lopped off their heads, brought them back to the site and cooked them, breaking open the skulls to get at the brains, and then tossed the skull pieces onto the fire. These pieces were then "discovered" by our experts who then claimed that the v were the fossils of the makers of the fire! The humans who tended this huge furnace were found much later in the adjacent cave. The scientist reporting on the human fossil finds of the nearby cave site died whilst examining. For full details see Ref. 46 p90-137. large brain and a human shape was too early for the neat line of human evolution. Gradually the fossil was downgraded and in the previous exhibition on this gallery of man's link with apes "Man's place in Evolution", 1470 man was virtually ignored! All this controversy within their own seems to have been forgotten, and the habilines, with or without 1470 Man, have been called into service to act as yet another "close relation to man "
-The effectiveness of this indoctrination was brought home to me whilst I was on one of my visits to the museum. The display cases were surrounded by a number of young schoolchildren. The master, in order to emphasise the information they had been looking at, was asking them in a parrot-like fashion "What are you? -- yes, you are a mammal. And are you a primate? Yes you area primate" and "Yes, you are an ape." I am sure that this master was convinced that he was conscientiously teaching his boys simple biological facts. Yet that same master, when faced by those boys later in their teenage rebellious years will no doubt admonish them by telling them to stop behaving like animals, completely forgetting that he had already instructed them with this "fact" only a few years previously! If people (and particularly the young) are told sufficiently fre­quently that they are only an animal, then we have no cause to complain if eventually they act like one!" continually taught that we are the product of spontaneous generation, chance evolution; and that mankind is the pinnacle of the evolutionary process. Those who dare to challenge the status quo and question the validity of the theory of Evolution are soon silenced and labelled as unscientific and/or religious fundamentalists. evidence to the contrary, or is living in a state of denial. have the highest intellectual credentials." 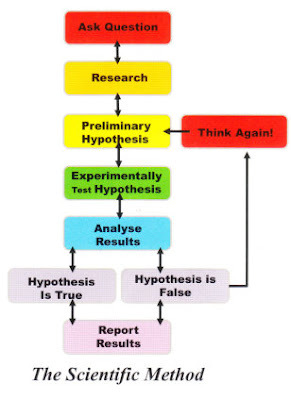 The Scientific Method Professor Louis Bounoure, Director of Research, American National Centre of Scientific Research has gone as far as saying: "Evolution is a fairy tale for grown-ups. This theory has helped nothing in the progress of science. it is useless." Evolution is by definition a religion – 'a belief held to with ardour and faith'; it is a belief system about our past, attempting to explain our origins. Sadly, its converts are often so aggressive in the promotion of their faith that it has put a strangle-hold on science from the classroom to the lab, a fact admitted by honest evolutionists themselves. Sir Fred Hoyle, a well-respected British astronomer, who demonstrated that evolution is a mathematical impossibility, said: "The situation is well known to geneticists and yet nobody seems to blow the whistle decisively on the theory... Most scientists still cling to Darwinism because of its grip on the education system. You either have to believe the concepts, or you will be branded a heretic." Astronomer, Robert Jastrow, who was the founder of the Goddard Space Insti that sent Pioneer and Voyager into space, commented: "Astronomers are curiously upset by... proof that the universe had a beginning. Their reactions provide an interesting demonstration of the response of the scientific mind — supposedly an objective mind — when evidence uncovered by science itself leads to a conflict with the articles of faith in their profession... There is a kind of religion in science." One of evolution's most virulent proponents, Richard Dawkins, stated of religion: "Religion demands belief in the supernatural" , but nothing exploding and becoming everything, spontaneous generation of life from non-life, one kind changing into a totally different kind is not a natural occurrence. in evolution requires belief in the supernatural. Dawkins continues: "Religion requires belief in things cannot be verified by science" . As this article will demonstrate, evolution cannot be verified by science . Dawkins concludes: "The time has come for people of reason to say: enough is enough. Religious discourages independent thought, it's divisive, and it's dangerous." Hear, hear Mr Dawkins! By his definitions, evolution "requires belief in things that cannot be verified by science", so is therefore a religion and he is absolutely right, evolution has discouraged independent thought — see the film `Expelled' with Stein for a shocking expose of evolution's strangle-hold on academia — and Dawkins is right, it is divisive and dangerous: Hitler used evolution as justification for his actions in extermination of the 'weaker' and less able to survive. Those who preach the religion of evolution are relentless in their 'great commission'; and there can be no doubt, evolution has been marketed so effectively that the average person in the street would not readily question it. If the question were asked 'do you believe in evolution?' many would happily answer in the affirmative. were then asked 'do you believe evolution is a proven fact? 'the same response would be given. However if you then asked for a single piece of scientific evidence, something that is observable, that doesn't have to be taken by faith, you may get a few who will cry 'fossils' (we will address that later), but the majority will be compelled to point you to the text books, the TV documentaries, or the 'scientists' — for they must have the evidence, right? The vast majority of those accepting evolution are seemingly happy just to put their faith in the 'experts', never stopping to ask questions. One evolutionist, reviewing the work of another, conceded: "We cannot identify ancestors or "missing links" and we cannot devise testable theories to explain how particular episodes of evolution came about... all popular stories about how the first amphibians conquered the dry land, how the birds developed wings and feathers for flying, how the dinosaurs went extinct, and how humans evolved from apes are just products of our imagination, driven by prejudices and preconceptions." Chris I live in Derby where the theory of evolution was birthed by Erasmus Darwin. He was a member of the Derby Philosophical Society, a gathering of rationalist thinkers, many of whom were freemasons. I asked the Lord what the stronghold of thought over Derby was and He pointed me to this society as the place where the phrase 'the survival of the fittest' was conceived as the 'soundbite' that summarised the evolutionary message for mass, unthinking consumption. There is a link to the slave trade and the finances that accrued from that injustice that flowed into the capital markets in the UK to finance the Industrial Revolution, re-seeding further injustice and enslaving millions to the false god of mammon. Because we treated men and women made in the image of God in the slave trade as if they were little more than animals God gave us up to a belief that we are created in the image of animals and not in His image. It is no coincidence that Derby is both the birthplace of evolutionary theory and the birthplace of the industrial revolution whose defining ideology is 'competition'. This word's meaning was twisted from its original sense of 'common petition' i.e. : 'common prayer' the intercessory role of the church to plead the cause of justice for the oppressed against an unjust oppressor. It was twisted to mean the exact opposite and mean "the survival of the fittest'. And so what is evil began to be called 'good'. God told me that the battle is all about origins because mis-conceptions result in abortive harvests. It's all about seed and harvest, God declaring the end from the beginning, the Alpha and Omega, the Word as seed in all created life. Challenging the Word is to lie about our true origins. As a side note, the masonic lodge in Derby was named after the city of 'Tyre', the Tyrian Lodge and Tyre was the seat of the cult of the goddess 'Europa'. Father has been sending His men and women from the very nations we once enslaved who have a redemptive calling from Him to bring us mercy and set us free from the sins that have enslaved us as a result. How we humble ourselves to receive, honour and welcome them is a key to how far we are set free from the consequences of all of this.